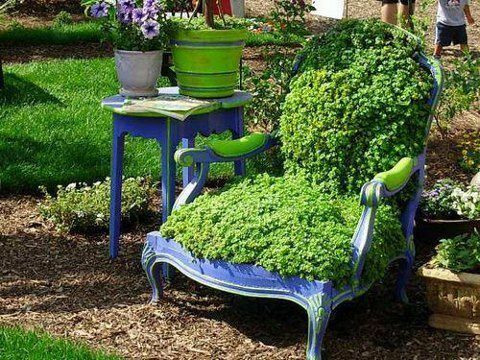 Plant your furniture…literally! We have run across these really neat ways to integrate plantings into your garden rooms, by planting your furniture itself! Really unique containers, and I love the idea of having plants as part of the outdoor room, not just next to it. 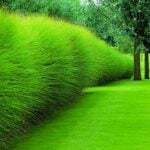 Some of these have some easy DIY instructions, and others are just inspirational to get your creative ideas flowing… but they are all great ideas for any garden seating area. 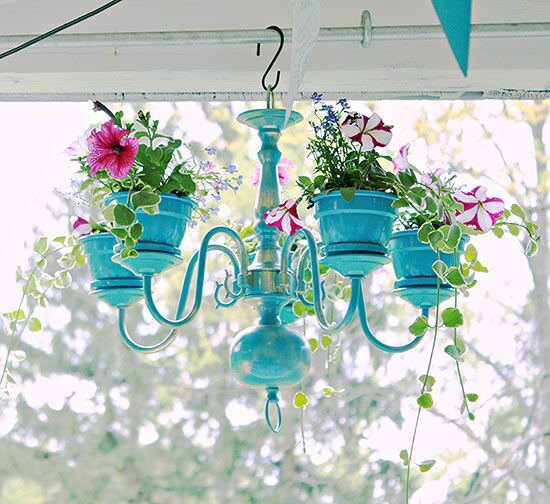 Remember, you can always alter a tutorial to fit your style and needs… love the chair planter, but it’s too cottage for you? Plant a simpler chair with succulents, or all foliage plants for a more minimalistic look. 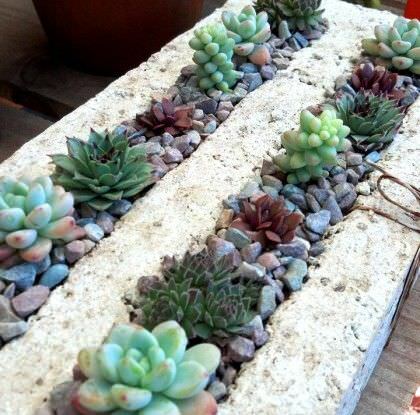 Use moss, or succulents, or try using all one type of flower in a project instead of a mix. 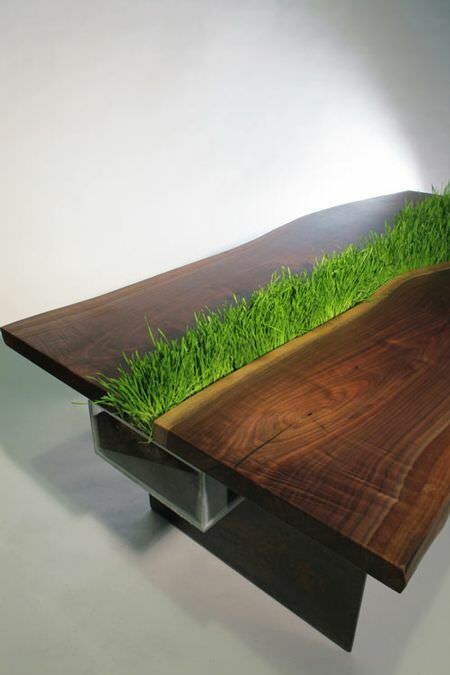 I actually love the simple green of the modern table planter with the grass… the deep green color also brings out the amazing wood the table is made of… Remember, if you decide to go it alone, and dive into creating a planter out of furniture, you must either accept that the weathering of the water and plants will eventually rot away the piece, or you must provide a moisture barrier to protect the furniture. This can be as simple as attaching some plastic sheeting with a staple gun. Remember, the thrift store and yard sales are your friend here. 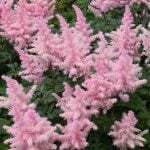 So here are our picks to plant your furniture! 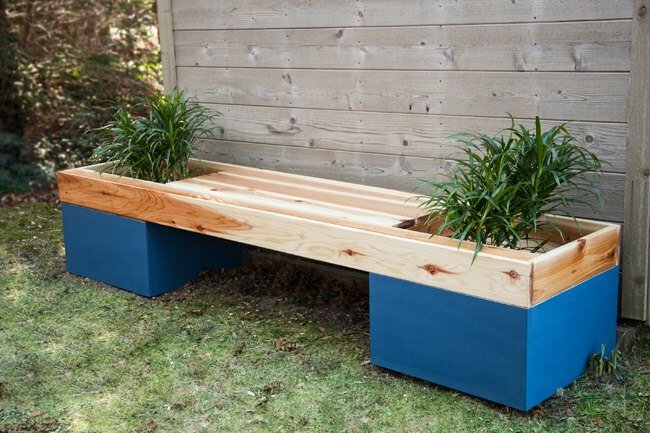 Build this awesome planter bench from ‘Black & Decker‘. Complete tutorial with step by step directions. 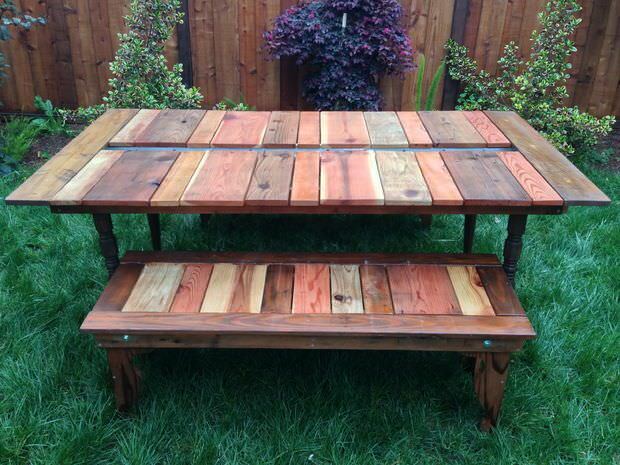 Made from cedar, so it will last! 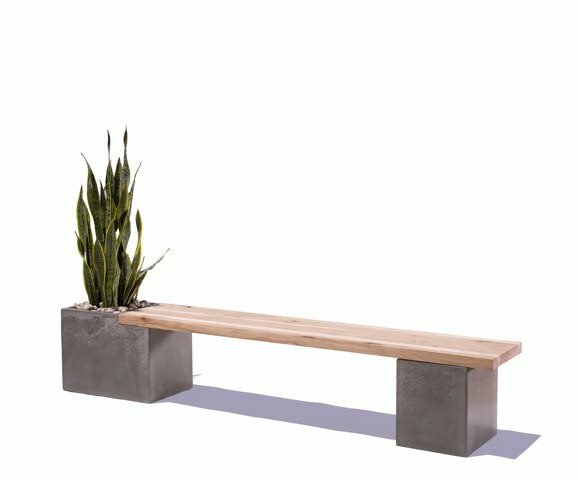 Make this modern planter bench with this tutorial from ‘Sunset Magazine‘. 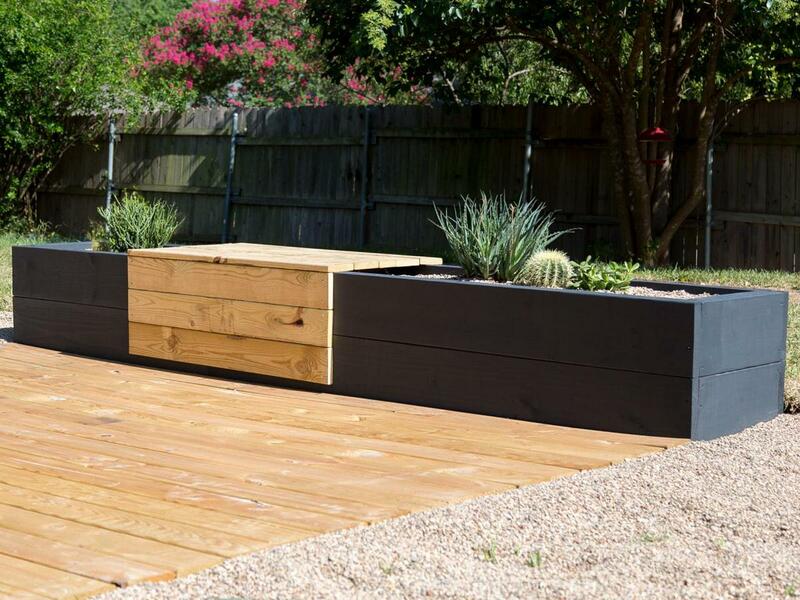 You build the wood top, then two large pots create the legs, and the planters! 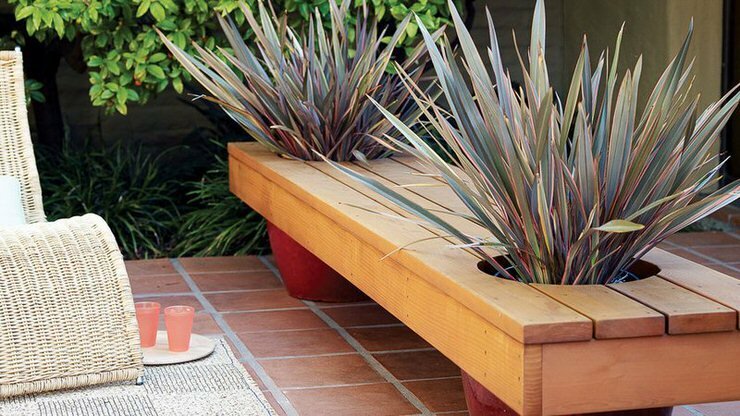 This planter bench combo DIY is from ‘HGTV‘. 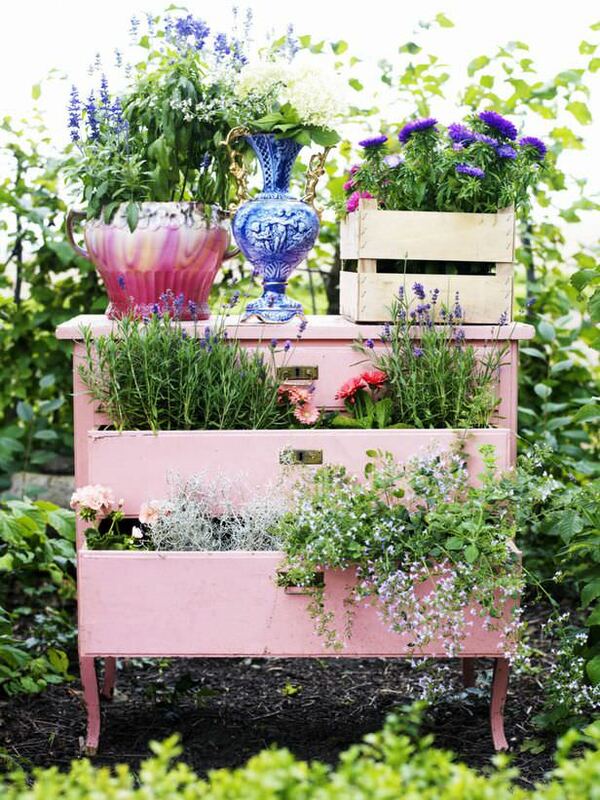 Perfect way to create space for patio seating, and also planters for your favorite herbs or flowers! This project from ‘HomeJelly‘ is one of my favorites, and simple enough for anyone… Its a ceiling beam planter bench, and has a complete tutorial. All you need for this is a drill, a chisel, and wheels if you want it to be movable…You could also do this with railroad ties, but I would worry about seeping creosote myself… Don’t forget to read their safety advice! Want a similar, upscale look? Tao Concrete on Etsy sells this version. We could see this being DIY’able as well. From ‘HGTV‘, this dresser planter is an easy one…just remember to line the drawers before you fill with soil if you want to preserve the wood. You could use the top as a serving buffet! From Katie Jackson Woodworks on Instructables, this Reclaimed Wood Picnic Table With Planter is pretty cool… you can use the center trough for ice and drinks, or plant herbs, pretty lettuce or edible flowers. This design is an award winner as well! 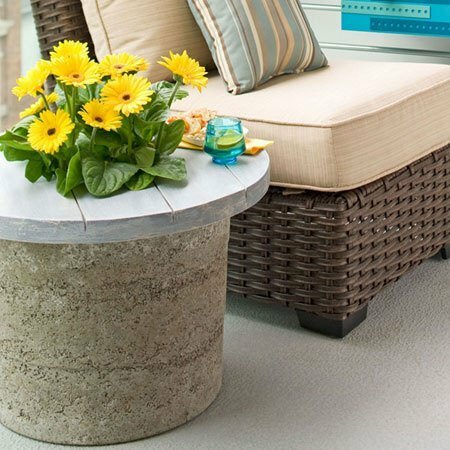 From ‘This Old House‘, this hypertufa planter table is clearly amazing… and the hypertufa is so much lighter and stronger than concrete. 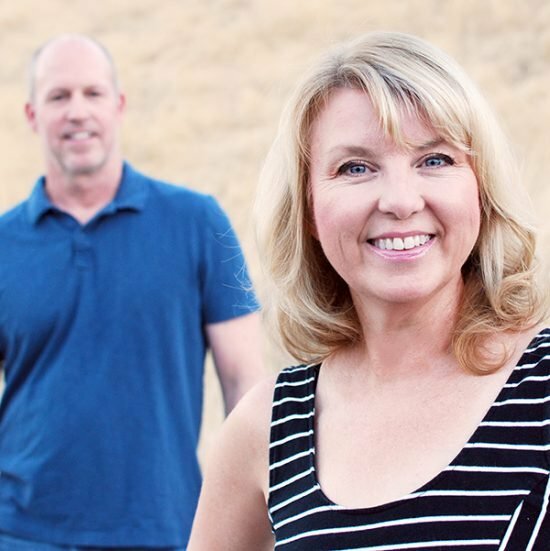 Great instructions for this project, and even a video. 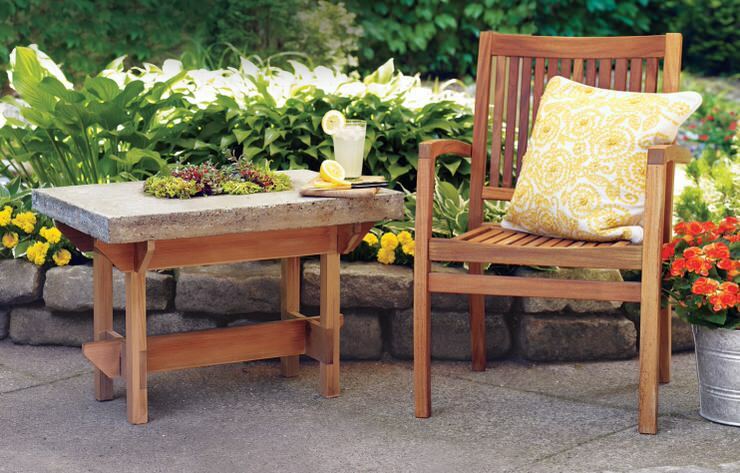 Since we are on hypertufa, ‘Lowes‘ has this step by step for this hypertufa planter table as well, and this might be a better beginner project. So cute! 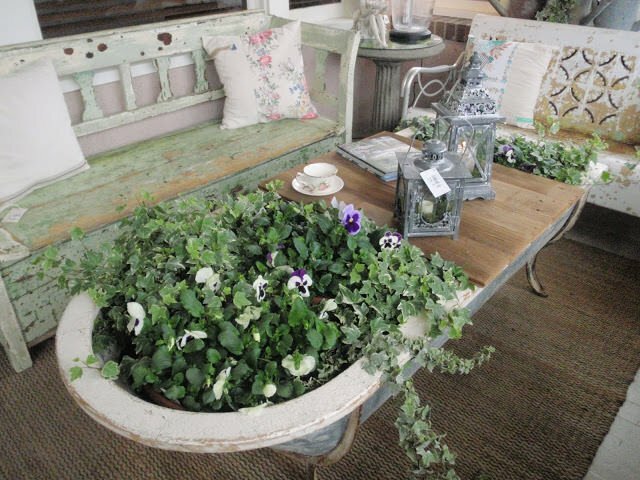 ‘Cactus Jungle‘ took the hypertufa table idea, created two troughs and used succulents. Cool! 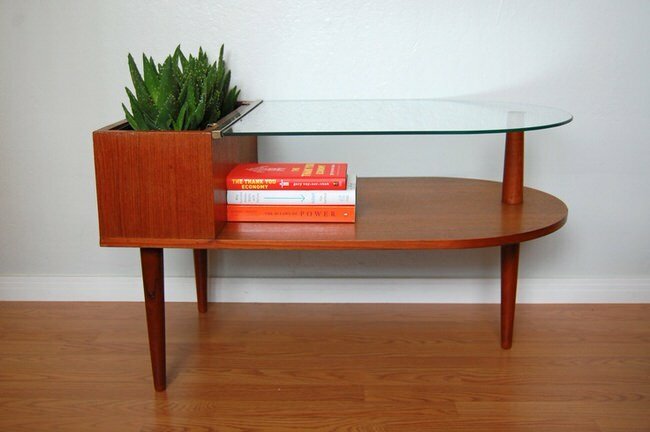 From Libby James, and totally inspirational, this is the modern table planter I talked about in my intro… This. Is. Cool. 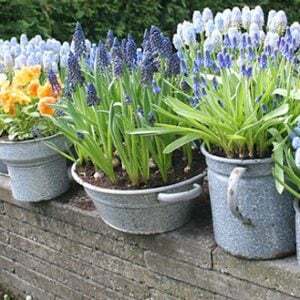 This tin bathtub planter table is great inspiration… This photo is by Hammers and High Heels from Bachmans in Minneapolis… This would be an easy DIY folks! 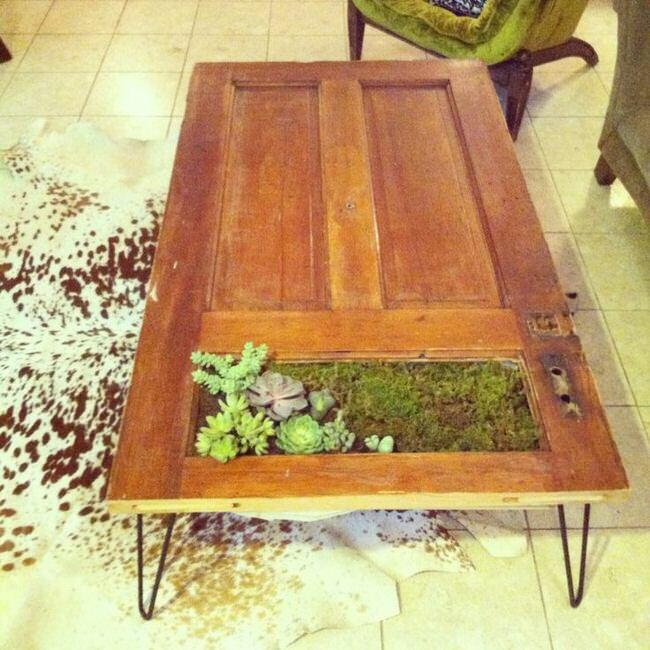 An engineering gardener created this planter table form an old door, and some hairpin table legs. Amazing ingenuity! 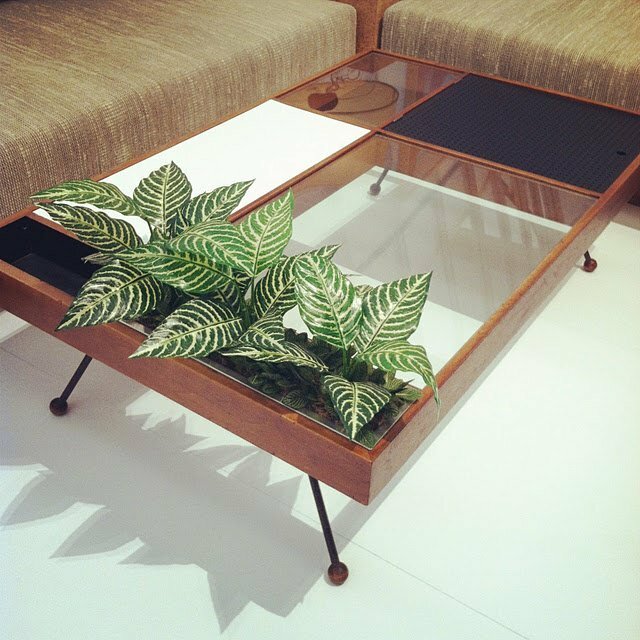 A lot of mid-century furniture was designed with planters, it was part of the theory behind the modern movement to integrate nature in design. Keep your eye out for pieces like this at yard and estate sales, and don’t be afraid to press them into use outdoors in a covered or protected area. 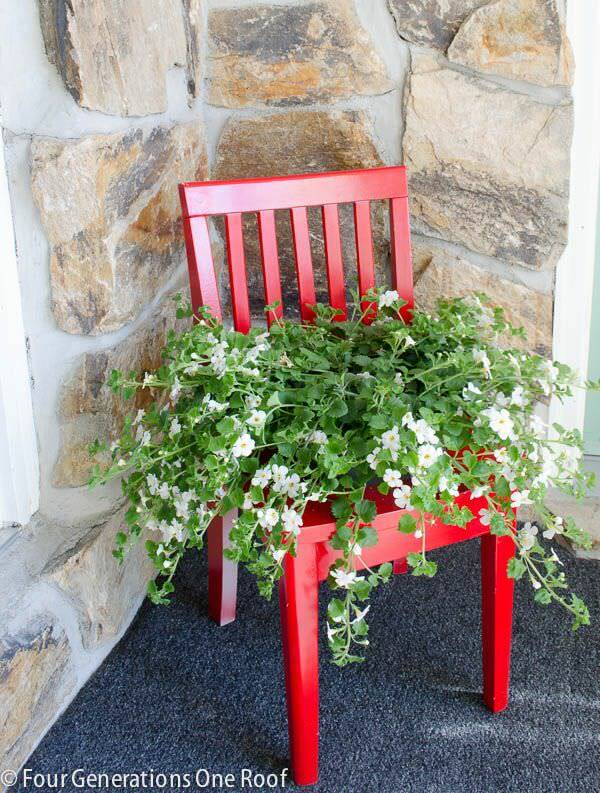 From ‘Four Generations, One Roof‘, we love this DIY chair planter. Color, not too cute but fun and fresh! Don’t forget to check out her complete tutorial. Purely inspirational, we found this photo on Pinterest, and I would love to have this whimsical piece in a corner of my garden! 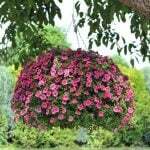 I would think you could DIY this with some chicken wire, a staple gun and some patience. If anyone knows who created this marvelous piece, please let us know, we’d like to pick their brain! 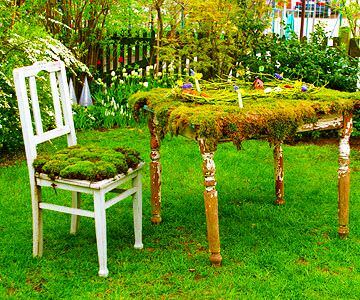 The blog that originally posted this idea no longer exists, but I had to include it… Again, staple gun, some soil, and some moss is all it would take. 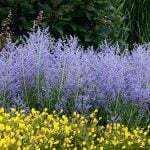 Remember if you use moss that it requires shade and water… There are some sedums now that have find texture that would give you the same look for sunnier and drier gardens. Sedum “Acre” would be great choice, and has tiny yellow flowers in summer. 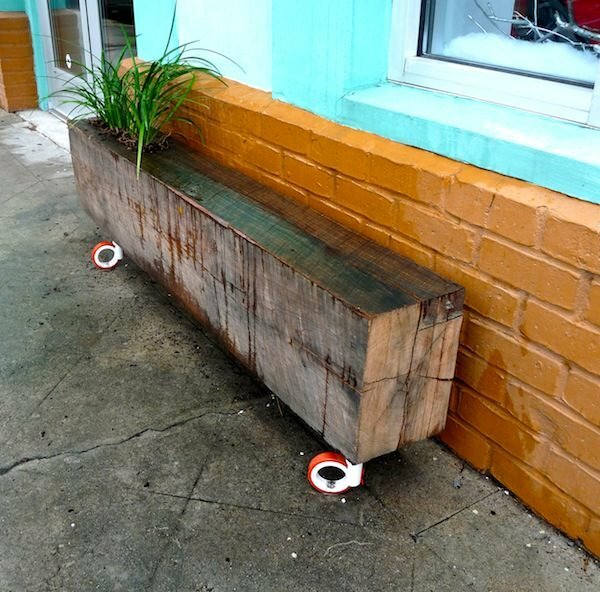 So whether you make a planter bench, table, or chairs, plant your furniture! 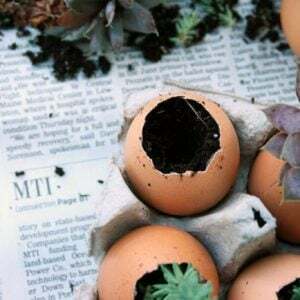 We think you will also love our posts on DIY Built In Outdoor Planters and may want to check out our post on Stunning Planter Box Ideas on our sister site, OhMeOhMy!